After Perth´s cool climate, it was a shock to land in the tropical heat of Broome in the North West of Australia. Fortunately it was a dry heat; not like the soggy conditions our peely wally Scottish bodies waded through in Asia. A mere sniff of the nose was enough to bring you out in another flood of sweat, gushing unstoppably from every pore in you body. Sure, Linx? Don´t make me laugh! If I had protected my body in two layers of tightly wrapped clingfilm, the sweat would still have found an escape route in less than a minute. The plane journey to Broome was a spectacular bird´s eye view drifting across the Australian outback. The red, arrid landscape defined by stunning shapes, tones and blended colours; stretched out below like an infinite Aboriginal canvas. The plane does a final low acrobatic turn and sweep over Broome´s perfect white beach and emerald Ocean waters before skimming the shore on its way to touch down. Broome is expensive. Our accommodation is the overpriced and sketchy Cable Beach Backpackers, which we share with lots of stewdent travelers and a smattering of aging hippies in worn tie-dye skirts. Including the men. To save on money, we stuffer a 3 day self-inflicted stint of tuna and pasta. And here´s me thinking our impoverished student days were behind us. But the landscape around Broome is stunning. At Gantheaume Point, Ospreys nest in the top of the lighthouse tower and beneath the orange rocks dinosaur footprints can be glimpsed at low tide. A lot more is on show at the nudist beach adjacent to the main Cable Beach. 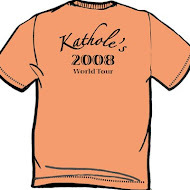 We almost dared but I´m not sure the rest of the world is ready for quite that size of shock. "Just fine where we are, thank you!" The sands were pure and the water crystal clear. One evening, after yet another mouthwatering feast of cold, limp tuna pasta, we headed for the Sun Picture´s screening of The Dark Knight. 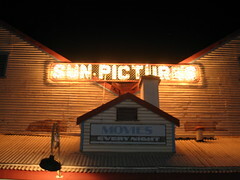 Sun Pictures, founded in 1916, is the world´s oldest outoor cinema. The wood panelled interior and rows of metal framed deck chairs are all original. They even project films on 35mm film and not some crappy knock-off DVD that their mate brought back from Bali . It has lots of history. In the early days, the local Aboriginals (black fellas) were segregated from the rest of the white fellas. These days it struggles to attract many locals away from their recent import of Bali DVDs. Which is a travesty. The atmosphere is superb. "See the stars under the stars," is their poetic slogan. The atmosphere is also unique. Directly underneath the airport flightpath, a Quantas jet flies inches over the audience´s heads, literally tickling the tops of their ears during the early evening screening; and scaring the life out of any innocent newcomers! Before our screening, we had been held transfixed with eery amazement at the spectacle of massive flocks (packs?) of flying foxes (fruitbats) silhoutted against the fading dusk sky. The film itself was tense, unsettling and truly excellent. Midway through the film a wayward, lone flying fox flew directly passed the screen, casting a huge batmanesque shadow across the picture. The audience shrieked in unison, then giggled collectively with nervous excitement and appreciation. You can´t scriptwrite that sort of thing. Movie magic! Broome was also our point of entry into the Australian Outback, the largely unpopulated land that covers nearly 70% of the whole of Australia. Tim was our guide. He has had many previous occupations: former jockey, blcacksmith, diamond miner, taxi driver and more. He was also complaining of recovering from a cold as the Broome temparature had dared drop below 25C! Wimp! Our vehicle was a 4wd battle bus / tank that left little in its wake. It had a quaint basket of fruit positioned at the front, as if to show it was in touch with its feminine side too. Our tank powered its way first of all to the sacred Boab Prison Tree. Boab trees (help ma Boab!) grow into adults of an awkward bulbous shape. As they grow they leave an empty chamber inside the trunk. In the dark days of the Colony many trees were used for imprisoning Aboriginals. At Wijana Gorge we stood incredibly close to lots of shy freshwater crocs. I learnt that it is infact the saltwater versions that are the bad muthas of Crocodile Dundee legend. Tim says that him and his mates have been swimming here before. We were able to test out that theory at Tunnel Creek where we walked through shallow water containing freshwater crocs. Tim told us all about the Aboriginal folk hero Jandamarra who used Tunnel Creek as his hideaway. After initial violence, he adopted a campaign of non-violent protest with the police, against the treatment of local Aboriginals. He was able to trick, confuse and scare the white fellas for so long that local Aboriginals began to decribe his actions as magical and treated him like a living God. A fascinating story. Our last 3 days in Oz were spent enjoying the chilled out European vibe of Melbourne. We messed around on the fabulous trams, visited art museums, walked in the botanic gardens, watched an historic AFL match on the telly (Dave would be SO proud) and purchased some very nice bottles of skinless wine. The main highlight, predictably, was food. In St. Kilda, the shore district of Melbourne, we found a very strong contender for the ´best fish and chip shop in the world.´ At ´Clamm´s´we devoured a blue whale´s helping of fresh fish, scallops, squid and Kathy´s favourite - the pineapple ring (I´m sure blue whale´s love pineapple rings too). With chips and a bucket of tartar sauce.